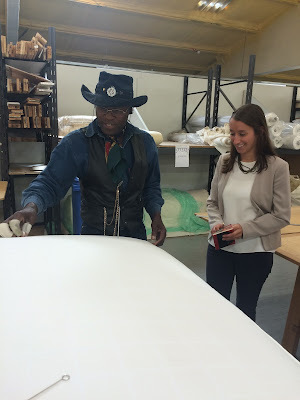 TJ Brown began his career as a seamstress of sorts creating clothing - everything from trousers to dresses to hats to shoes - for friends and family who had admired his own hand sewn style. Upgrading from his mother’s sewing machine to a full time position in a textile cutting room in London, TJ honed his skills in both needlework and construction. 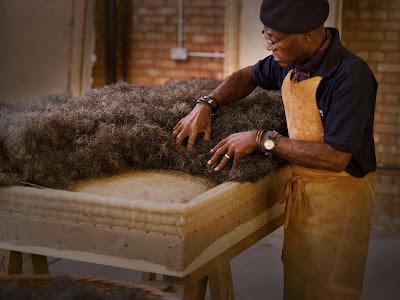 While working in the cutting room, Brown was approached by Alistair Hughes, the Managing Director of Savoir Beds, as Alistair noticed his unmatched skill, to see whether he would be willing to translate his expertise in fabrication to bed making. 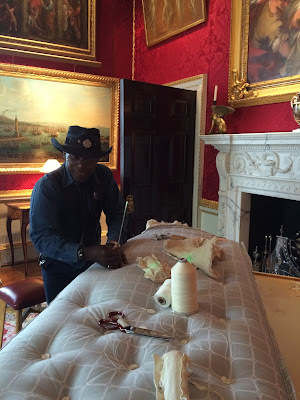 Often found in a well-made suit with an antique pocket watch at the ready, TJ is never far from a needle and thread in the Savoir Bedworks. Brown has evolved with the company, seeing it grow from seven employees to now, over 80, and he cites Savoir’s family atmosphere as one of his favorite parts of his job. When TJ started at Savoir Beds in 2000, he was responsible solely for crafting mattress springs. He then quickly advanced to creating bed bases to finally making from start to finish the world’s finest mattresses. 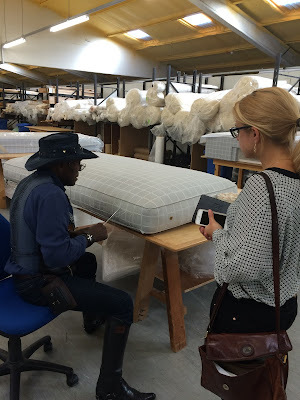 TJ’s eye for fashion and textiles has always allowed him to approach bed making like a tailor, understanding that he was creating a bed that was to be the perfect fit for a single client. After working over 15 years at Savoir, TJ has been afforded the most prestigious of projects for the brand, including creating the mattress for its highest-end Royal Bed, which retails for over £125,000. Tj brown and his clothing factory is really doing some great stuffs. This man should be known internationally as because his works has so much qualities. read here if you want to know more about the quality writing services. I have been looking for some good it outsourcing company ukraine because i am new in ukraine and started my business. But for IT it is better to outsource instead of hiring professionals. pixel gun 3d generatorgreat game forever.